He’s very pleased to meet you. 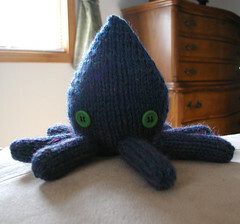 Actually, Squiddy was supposed to be an octopus but Mr.V informed me that a pointy head is squid thing. Oh, well. He’s still cute. Yarn: Some scrap LB Wool-Ease and part of the Clapotis I never wear. Mods: The pattern suggests making two increases per increase round. I did that and I would suggest doing that too, otherwise you might end up with a REALLY narrow head. But I guess it all depends on what yarn and needles you use. Woulda-Shoulda: I kind of fudged the base (which you seam on separately), but you can’t really see that unless you actually look, so it’s alright. What exactly does a grown 20-something do with a knitted stuffy? She’s sits it on a bookshelf at work, of course. He can be my pick-me-up when work gets dull and slow- a reminder of the fun activity that awaits me after hours. And yes, I did sacrifice a Clapotis to make a leg and the base for Squiddy. I’ve probably committed some knitting mortal sin considering how popular the Clapotis is. But before you cast the stones hear me out: I don’t wear it. Not because it’s a bad design. It was because I chose the wrong yarn. It was my first big knitting project and I didn’t know any better. I plan on making another one (possibly mini-sized) with some variegated yarn like the pattern suggests (possibly even dyeing my own since Knitpicks has expanded their Dye-Your-Own yarns to different weights, plus superwash). Thanks for all the feedback on the Trial and Error Tank (aka, the TET)! I’m a little less critical of it after reading your gracious comments. I do think I’ll frog the ribbing part and re-knit it with some more shaping and less ease. But I will be keeping the ribbing thanks to your input (and I’ve finally gotten over my “it makes me look fat” mind-set, sorry for that). I also think I’ll be adding some crab stitch crochet edging to the straps and top edges to battle the “rollies”- thanks to Cheryl for that suggestion (you rock!). So it seems the saga of the TET continues. I’m back to inventing the wheel with my new project. An umbrella cozy? Just wait and see. Squiddy is quite a cutie! Ok, first of all... Squiddy is so super cute, I can hardly get over it! And secondly, I just got around to seeing your self-designed tank and it's wonderful. It fits you so well! Oh my gawd, I love Squiddy!